Have I done enough training? - Not as much as I wanted to as I was injured for 10 days, followed by being down with flu for one week in the most crucial training period. Have I trained at the right paces? - Not as much as I should have. My long slow runs should have been at a slightly faster pace according to the requirements of my training program. Will I be able to run the marathon in my goal time? - I don't know. I don't want to be too optimistic and then be disappointed. So rather be pessimistic: It's looking bad because of the issues mentioned above. Perhaps my goal time was a tad too ambitious anyway. Will my leg injury play up again before the marathon? - I never know when it comes on, as the pain only starts after a run, when it's all too late. The first time it happened was after a 25k run. After I recovered, I did 29k and 32k runs just fine. After the 35k run and a Half Marathon it played up again a bit. So should I go for that 17k social run tomorrow with my running buddies?? Or will it spoil everything? If my leg falls off after the marathon, fine. But please, hang in there for another week! Will I be getting a bad cold or stomach bug before the marathon? - That's the worst nightmare. Training hard for 3 months and then not be able to run because of a minor illness. My daughter has got a cold already, and my son reported a classmate vomiting in school yesterday. It's looking bleak! I find myself moving back a step if I hear someone coughing. My sister will come for a visit from Germany next week to cheer me on at the marathon. I am praying she doesn't catch some crazy bug while sitting on a plane with 300 people from all over the world for 7 hours. Thank God there are the good voices too. I am an experienced runner, as I have been running for 10 years including countless 10k races and half marathons. I've got a race strategy and I can stick to it. I am disciplined enough to run my own race, and not get carried away by others who start off too quickly. I am consistent. I know my reserves well enough to settle into a pace that I can keep up for the whole distance, or even notch it up in the second half of the race. The second half of a race is my strength. I am the master of negative splits. It gives me all the motivation and energy I need for those last 10k, when I keep overtaking those people that ran off too fast. So here I am sitting, with these thoughts on my mind on an infinite loop. It's gonna continue for another week, and it's gonna get worse. How to keep calm? I don't know. The pre-race jitters are part of the whole game. The easiest part at this stage, seems to be the food. I am eating my usual stuff, and don't restrain myself when I get an appetite for carbs. In fact, I have been eating most of the gingerbread house that I made with my kids at Christmas. Only the front wall and bottom are left after a week of marathon taper. Although I am not too keen to try any new foods, most plant-based dishes are pretty safe to try. 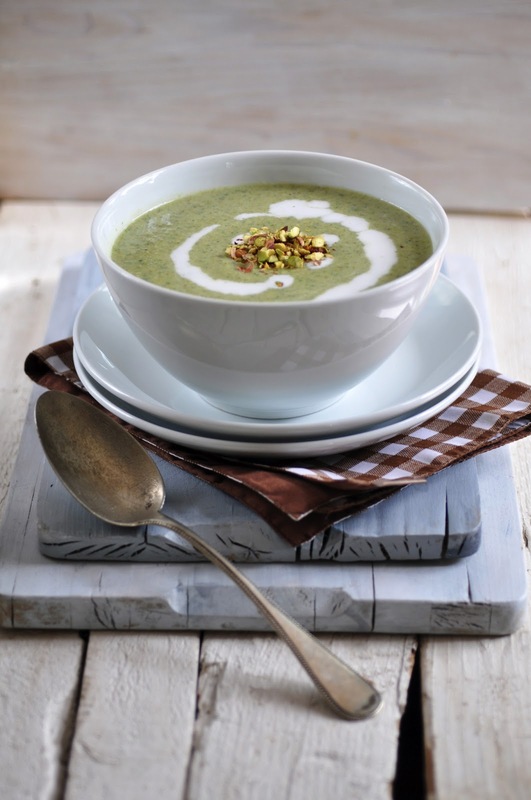 I came across this "almost cheezy broccoli soup" at Peachy Palate. I was intrigued immediately, wondering what would give the almost cheezy flavor. It comes from toasted pistachios and coconut milk. It adds amazing flavor and depth while you can still taste the freshness of the broccoli and some spinach. On top of that, it's whipped up in 15 minutes, as the broccoli doesn't need long to cook. This soup shot into the Top 10 of my favorite dishes like a rocket. Delicious, healthy, very filling and quick to make. Enjoy. In a skillet, heat coconut oil over medium heat. Add onions and garlic and cook for a few minutes, until onions have softened. Add broccoli florets, sea salt and water. Bring to boil, cover and simmer until broccoli is cooked, about 8-10 minutes. Meanwhile, toast the pistachios in a dry pan over low heat for 5-7 minutes. Shake the pan a few times for even toasting and to avoid burning the nuts. Set aside. Take off the heat. Stir in the spinach and let wilt in the hot mixture. Add the toasted pistachios (keep 2-3 tablespoons aside) and the coconut milk to the broccoli spinach mixture. Then blend with a hand blender or transfer to food processor and blend until smooth. Season to taste with salt and freshly ground pepper. Chop up the remaining pistachios. Transfer the soup to serving bowls and garnish with chopped pistachios and a drizzle of coconut milk. Ready to serve.